Poor Little M has developed yet another cold this week, so we’re back to snotty noses, nasal aspirators, calpol and saline spray. Bless her. I think she managed about three days without a runny nose! It must be Autumn! Fortunately, the first half of the week was a cold-free period, so we got out into the garden on Tuesday and I hacked away at the plants to get the garden tidy, ready for Winter. 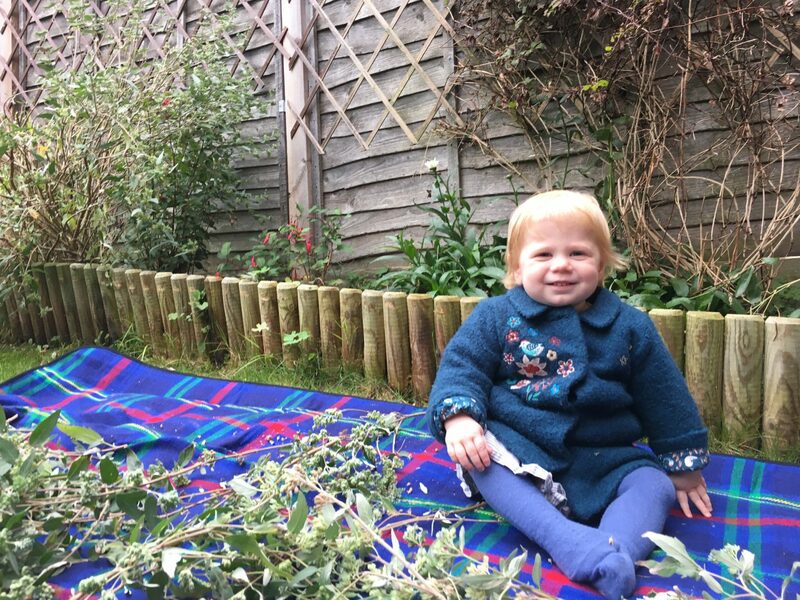 Little M loves going out in the garden, so we didn’t let the fact that it’s getting a bit chillier these days, stop us. Coats on, we were ready for anything! Well, almost. Little M isn’t walking independently yet, so up to now, we haven’t put her in shoes as we were worried about damaging her feet. However, now that it’s generally wetter and colder outside, and she’s keen to walk about lots holding onto our fingers, we felt it was time to get her some little pre-walker shoes, which we did on Sunday. This photograph was taken on Wednesday, though, so as you can see, Little M is in tights. She seemed quite happy though and enjoyed passing me various leaves to put in the rubbish bag. Little M is actually rather skilled at selecting weeds and pulling at them! Fortunately, we didn’t have anything prickly in the flower bed! As you can see from the photo, I went to town on the foliage as I want to move around some of the plants in the garden. So, if they haven’t died from me hacking at them, I’ll be impressed if they survive a move, too! We didn’t move anything this week, though, because as you can see, the fuchsia behind M is still flowering, and I’ve been told it’s an absolute no-no to move them while they’re still in bloom! It was really nice getting out into the garden for a bit, even though it was threatening to rain. We must do it more often! "Why have a second child?"